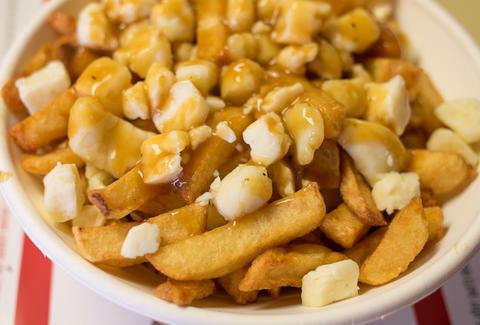 Fresh, hand-cut fries; cheese curds imported from Wisconsin; and super-secret recipe gravy made from a blend of different stocks and spices form a glorious dish that is perfect in its simplicity. 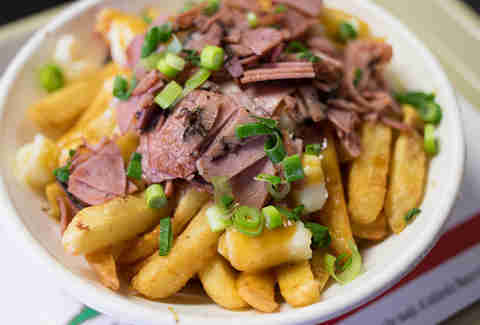 If you’ve never tasted poutine, start here before moving on to more creative takes. Some of the more exciting options start with the same three ingredients as the OG (fries, gravy, and curds), but don't stop there, with additions like bacon, pulled pork, and jalapeño (on the Blazing Pig), or NY-style pastrami (on the Brooklyn, pictured above). If you’re a fan of carne asada fries (which is to say, you have functioning taste buds), you’re definitely going to need to try the El Pancho, with premium rib eye and strip steak heartily seasoned with Montreal steak spice. Sesame bagel sandwiches, breakfast items, pulled pork & bacon sandwiches, and slow-cooked candied bacon bites with a pale ale & maple syrup reduction round out the menu. Wear baggy pants. Hugo says the MTL Toasties (Montreal-style hot dogs) have quickly emerged as a customer favorite. 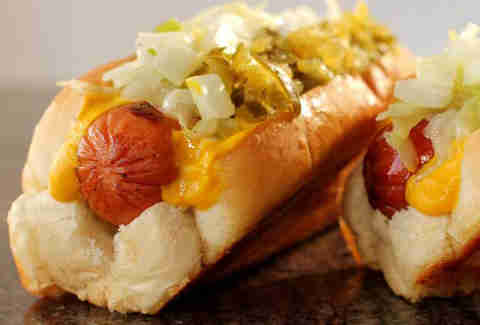 The all-meat (chicken, turkey, and pork) or all-beef links are nestled into toasted and buttered buns and topped with mustard, relish, onions, and house-made coleslaw. It’s tough to do better for $3.50. 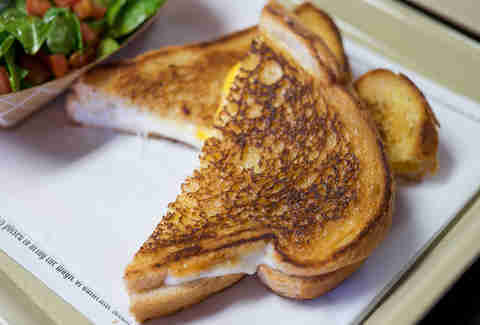 The meat-heavy menu doesn’t offer a ton of options for vegetarians, but the three-cheese grilled cheese sandwiches; salads; and bagel sandwich with walnut cream cheese, pear, arugula, and balsamic glaze are all worthy choices. It’s also possible to order a side of fries and some cheese curds, which will give vegetarians a vague idea of how delicious poutine is (still, cheating and ordering the OG poutine is a much better idea). Hand-rolled sesame seed bagels are flown in from St-Viateur (a legendary Montreal bakery) twice a week. 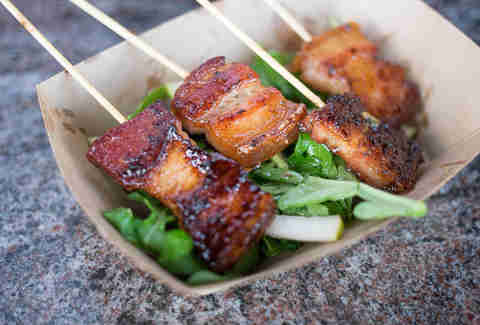 Your best bet to score a fresh one is to time your visit for a Thursday. 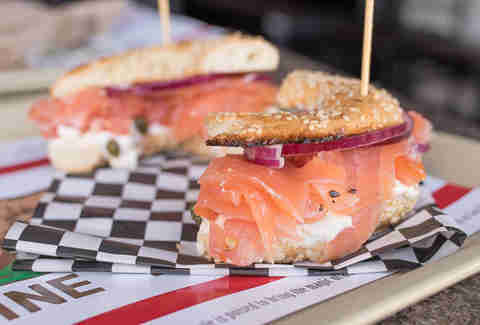 If you’ve never tasted a Montreal-style bagel, you’ll soon understand why Hugo goes through all the trouble to get the slightly sweet, dense, and chewy bagels all the way to San Diego. The Norwegian smoked salmon with cream cheese, capers, red onion, and tomato is a wise choice -- or, try the roasted turkey with bacon, Monterey jack, lettuce, and spicy chipotle mayo. You can’t score Canadian beer, but the shop stocks a selection of craft brews from Ballast Point and several domestics (in bottles). Hugo says he decided to highlight local suds because, well, it's San Diego. Why wouldn't you? TVs are constantly tuned to the NHL Network, but the sound is off so you can enjoy the chill soundtrack of reggae and lounge music while you consume thousands of delicious calories. 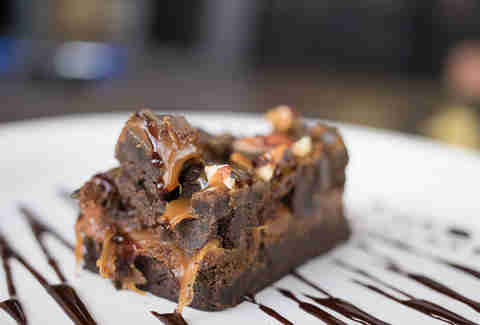 Poutine isn’t exactly health food, but if you’re already eating French fries, cheese curds, and gravy, you might as well go all-in with a Rockslide brownie with rich, chewy caramel and buttery toasted pecans. It’s already a big seller at Au Pied du Cochon in Montreal, so it only makes sense that this so-bad-it’s-good dish makes its way onto the menu at Mess Royale as a monthly special. Hugo says it won’t be cheap, but it will be worth it.